We love creating stories. Why not have a video of YOUR story? We capture all the important moments at your wedding so you can re-live the big day! Start to finish filming. We capture the wedding party getting ready until the final exit of the night. You receive 3 videos as part of the final product! Wedding Trailer: cinematic edit of the highlights of your wedding day. Perfect to share with family and friends online! Typically 3-5 minutes long. Full edit: full cinematic edit of your day. Includes more details not shown in the trailer. Typically 10-15 minutes long. 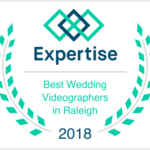 If you are interested in a videography package or just have questions, we’d love to help! Call 919-271-3190 or email [email protected].